Happy Monday, reader! I’ve been in the mood for nail art, so here’s some nail art! And really I mean that I finally remembered to buy some sponges so I can do some gradients. I’ve missed them! For this look, I used Blue-Eyed Girl Lacquer‘s Thrill Me to the Marrow (pale pink) and Robo-Aggression (gray), Pepper Pot Polish‘s The Big Fuzz (peach), and Elevation Polish‘s Sample JY #26 (glitter). For the gradient, I put down two coats of Thrill Me to the Marrow, then started a three-color gradient, only my nails are too short for three colors to really show up. You can see there’s a faint bit of coolness at the bottom near the cuticle that immediately fades into warmth from The Big Fuzz. In a way, it actually turned into something cool, but I’m still a little sad it didn’t get more visibility. The Big Fuzz and Robo-Aggression worked pretty well here; the peach was a little on the sheer side and I worried about how well it would show up, but it did the job. Robo-Aggression is a gray creme rockstar. 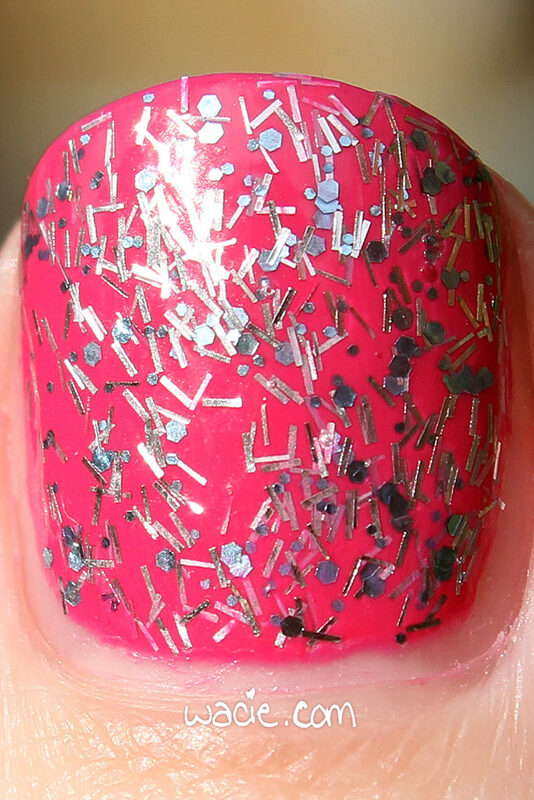 Sample JY #26 is the main polish I wanted to use, and it’s a pretty typical Elevation topper. 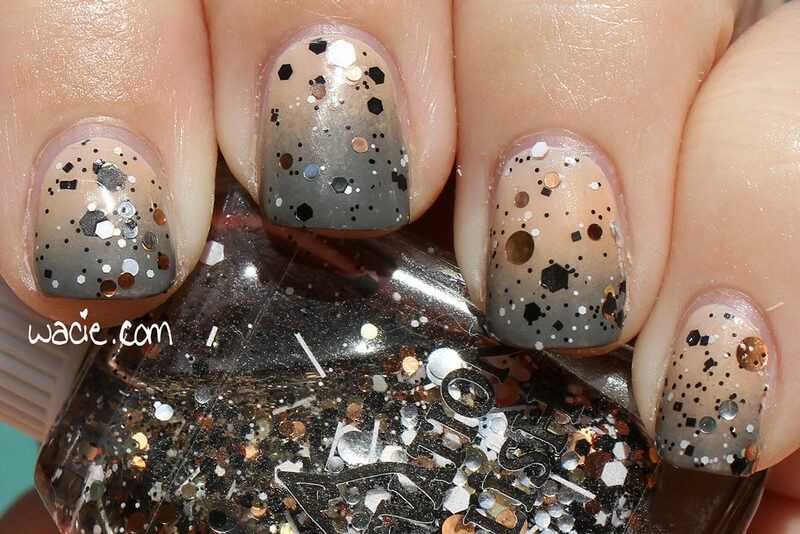 I’m a huge fan of the metallic round glitters they use; they remind me of coins. 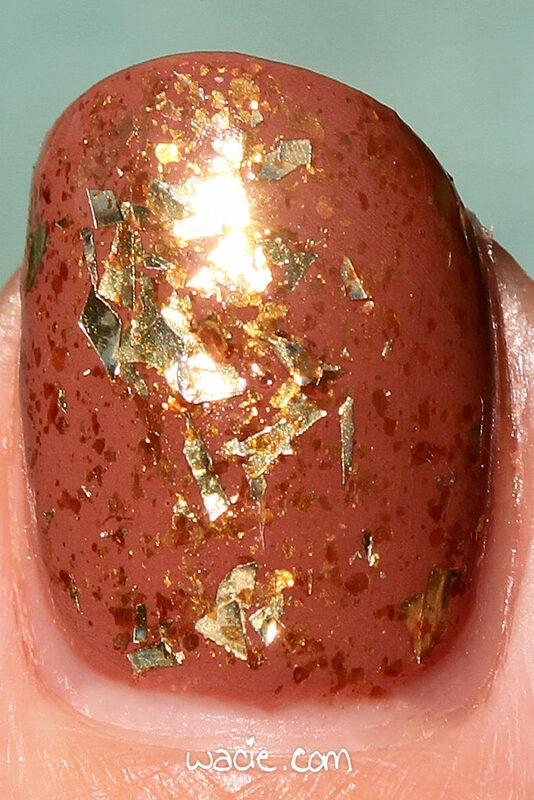 The polish has three different colors of them: gold, silver, and copper, as well as black and white hexes and squares. It’s the perfect topper for this gradient. The BEGL shop is still on hiatus, but plans to return soon. The Big Fuzz was an Indie Shop Atlanta exclusive; other Pepper Pot Polishes can be found in their etsy shop. 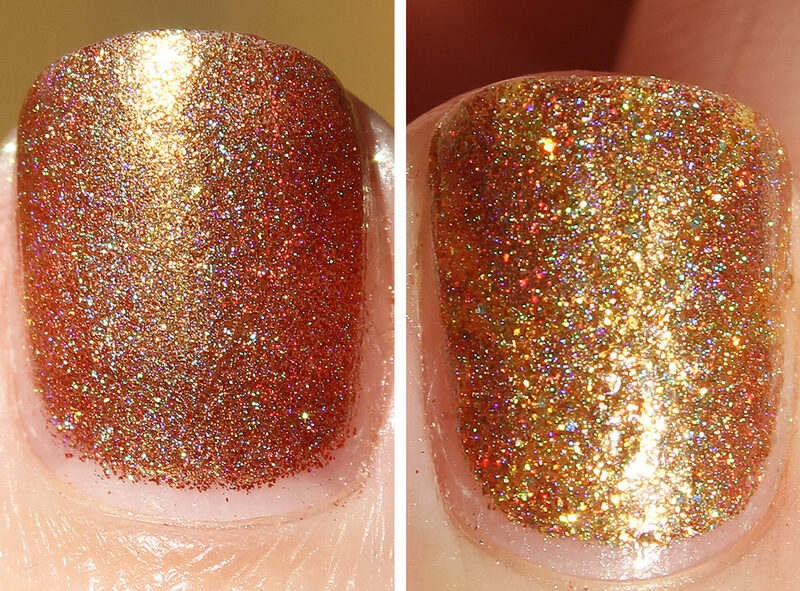 Sample JY #26 was a prototype; other Elevation polishes are available in their online shop. Happy Monday! This post is going up a little late. Today was my day off and I was lazy all day. There’s a lot of fun happening this week though; The Indie Shop Atlanta is this weekend, and I’m putting my mani together for that. I’m dying to go! I hope I’ll see some of you there, and I can’t wait to show off my haul. That said, let’s dive into my mani for the week! 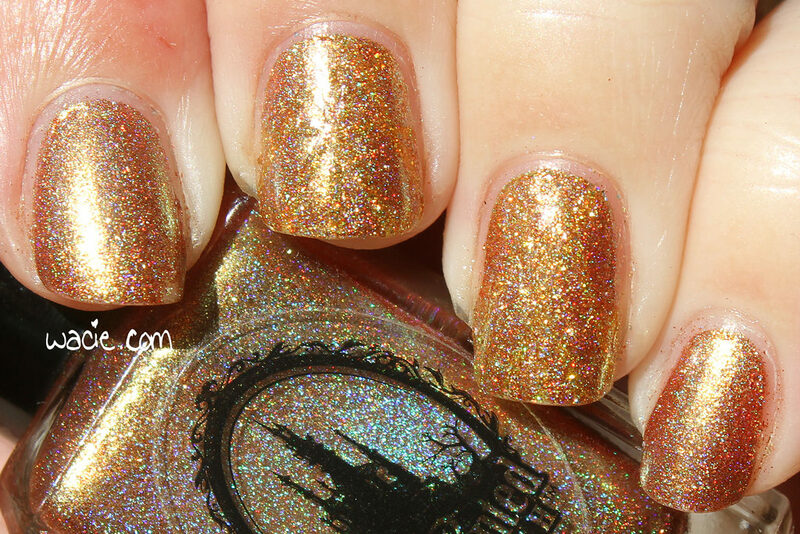 This is Blue-Eyed Girl Lacquer‘s Fare the Wind with Lynnderella‘s If the Shoe Fits. Fare the Wind is way prettier than I remember it being when I swatched it three years ago. 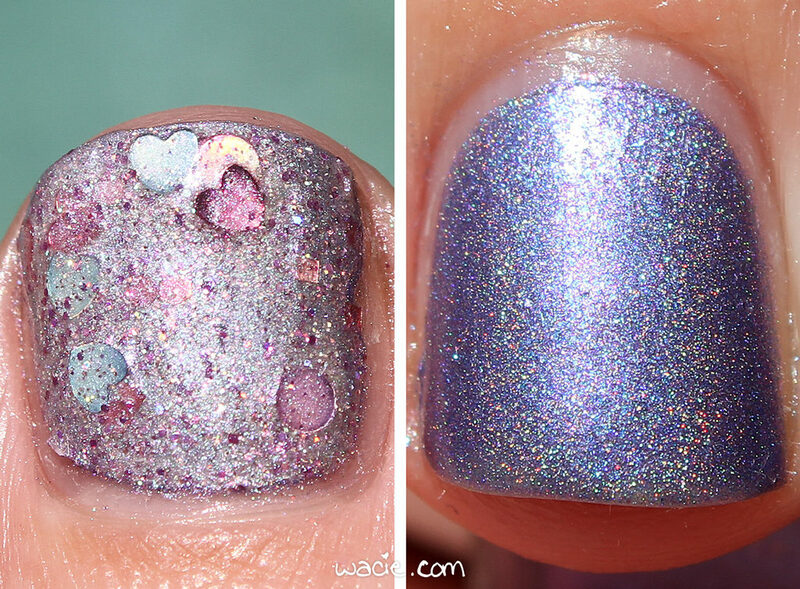 The purple is a nice mid-tone purple; it’s a strong shade, but the holo doesn’t overpower it, and the blue flakies in there don’t get lost. The sunshine overpowered it a little, but you can still appreciate it. 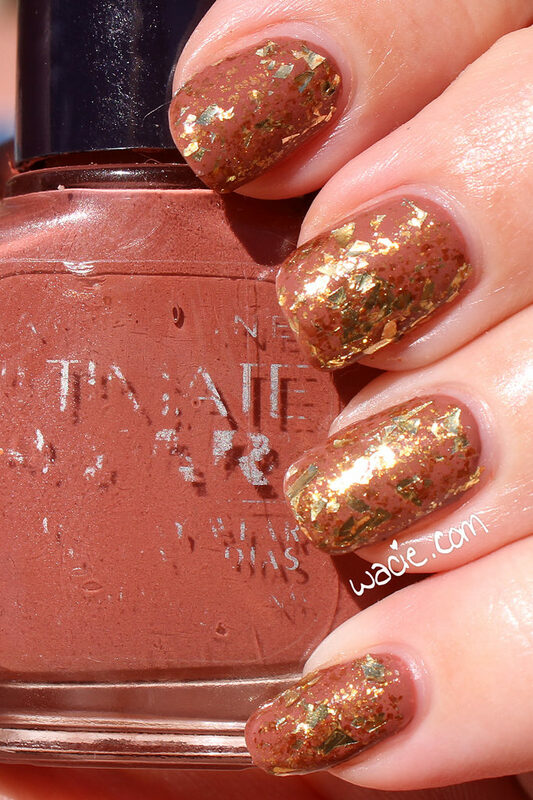 I love this shade, and I love digging out shades that are a couple years old and were possibly forgotten about. In a community like ours, where we’re always excited about whatever new polishes are on the horizon, it’s important to shop our stashes and give love to polishes we have (she says, as she prepares to max her credit card out at TIS Atlanta). This is actually the first time I’ve used If the Shoe Fits. I fell in love with it when I bought it, and then I forgot about it. I’m actually wearing it here over Fare the Wind, and it’s so shimmery that I didn’t need to wear it over anything. I’m a sucker for anything with heart-shaped glitter in it, so this was an easy buy for me. Can’t wait to use it again! Blue-Eyed Girl Lacquers are available from their online shop; they’re currently closed, but will return soon. Lynnderellas are sold on eBay and their website. Happy Wednesday! I planned to wear this polish on Monday for my Manicure Monday series, but my weekend look got irreparably smudged right after I finished, and being low on top coat, I decided just to go for the textured polish right away. I actually wore this polish from Saturday to Tuesday with minimal chipping. This is Nicole by OPI’s That’s What I Mint; I’m wearing three coats. I was super impressed by how well this wore on me. I’m not one to wear a polish more than a day or two, and that’s largely because of how quickly it chips. One will chip and then I end up picking at it and all the others until there’s nothing left and I have no choice but to start over. I’m actually kind of proud of myself that I kept polish on for four whole days. Nicole by OPI is sold in stores; I got this one from a Target clearance bin. Happy Monday, reader! I have another easy/lazy nail look this week. 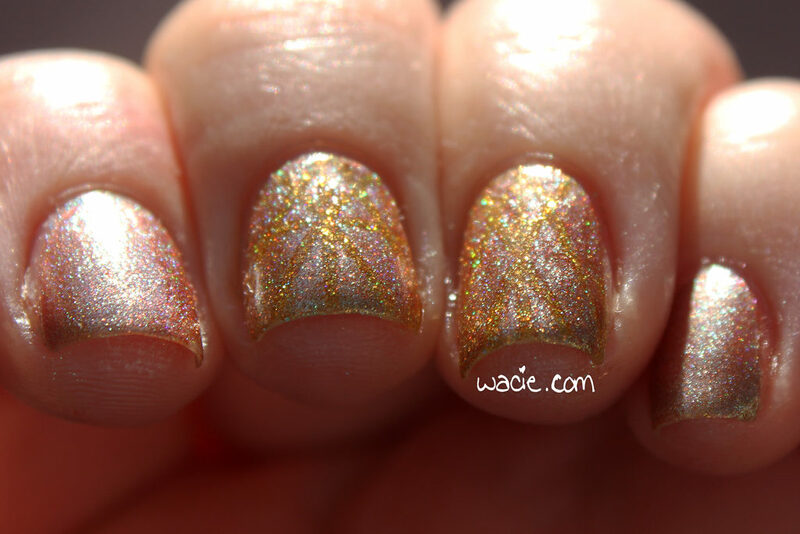 For this look, I used Elevation Polish‘s The Merchant’s Son under Ciaté’s Snow Globe. It’s opalicious! Snow Globe was the main polish I wanted to use here. I was such a huge fan of these shredded iridescent toppers when they came out; even now, I still can’t get over that Mylar-esque shine and all those colors. Of course, this is as bumpy as it looks; one coat of Seche Vite wasn’t enough to smooth down all those jagged edges. For this reason alone, I’m glad we moved onto flakies. The Merchant’s Son, as you see it here, is a former thermal polish. I even dug this one out hoping for the thermal effect to add some complexity to this look, but alas, thermals don’t transition forever. There’s a fine green shimmer in here that got a little covered up, and definitely doesn’t come out on this cloudy day. You’ll have to take my word for it. Elevation Polishes are sold in their online shop. Ciaté is sold at Sephora. Welcome back, reader! I have an old Manicure Monday that I never got around to posting. This must have been done around Christmas, when I was hellishly busy at work. 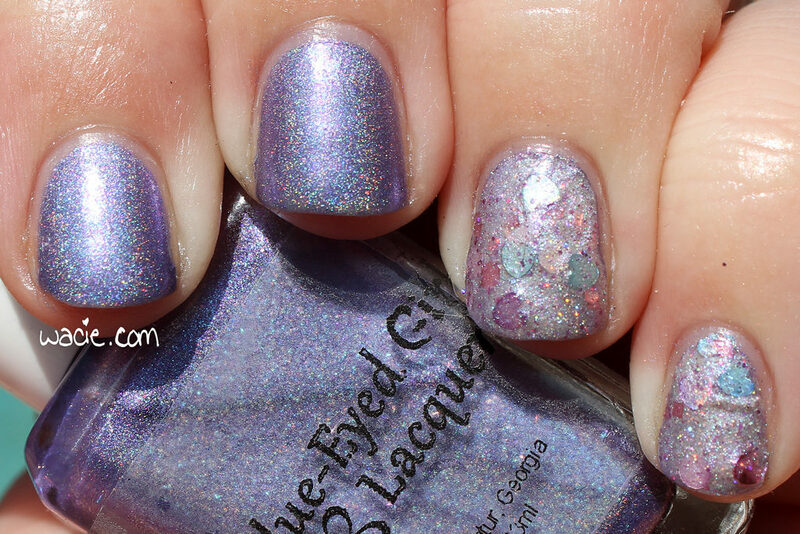 For this look, I used Blue-Eyed Girl Lacquer‘s 2014 and Siren’s Quarter Life Crisis. Remember 2014? I barely do. I remember buying this polish, though! 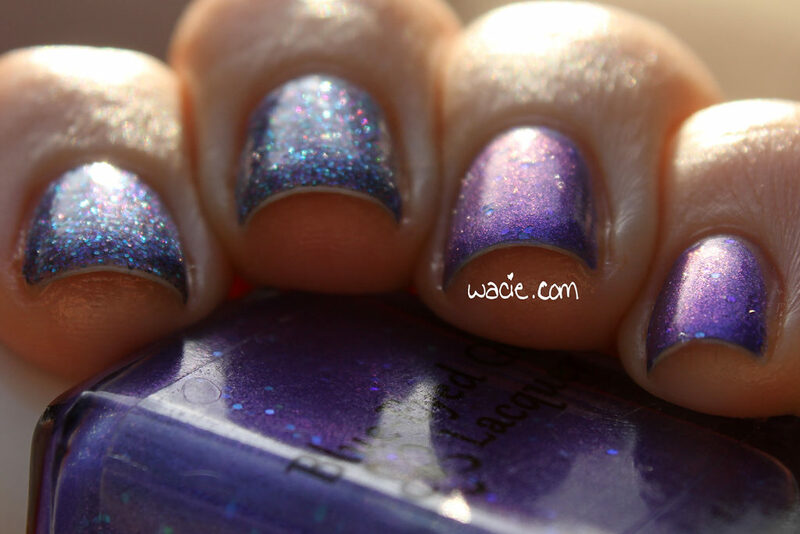 This is a sheer purple with a strong shift, as well as some iridescent glitters throughout. The shift doesn’t come out so well in bright sunlight, but it’s definitely there. 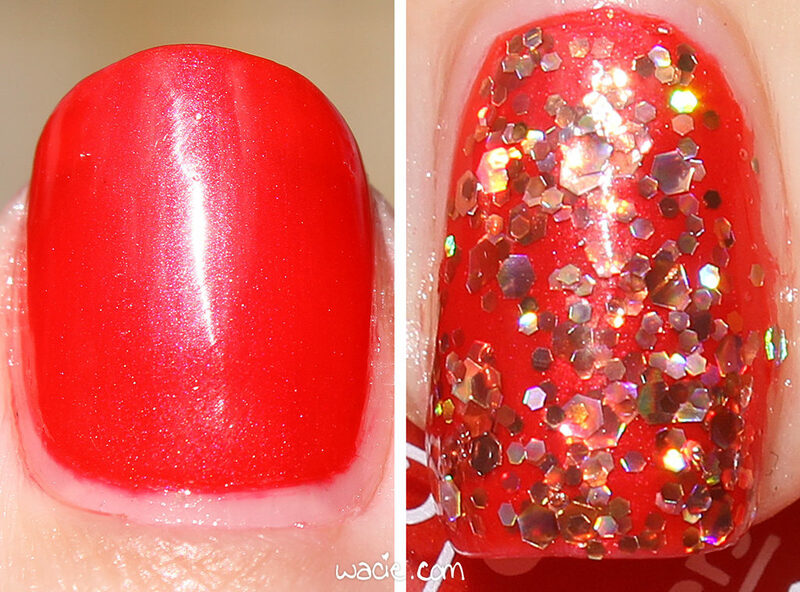 I love the glitters in there the most, it’s what sets the polish apart from other shifters. 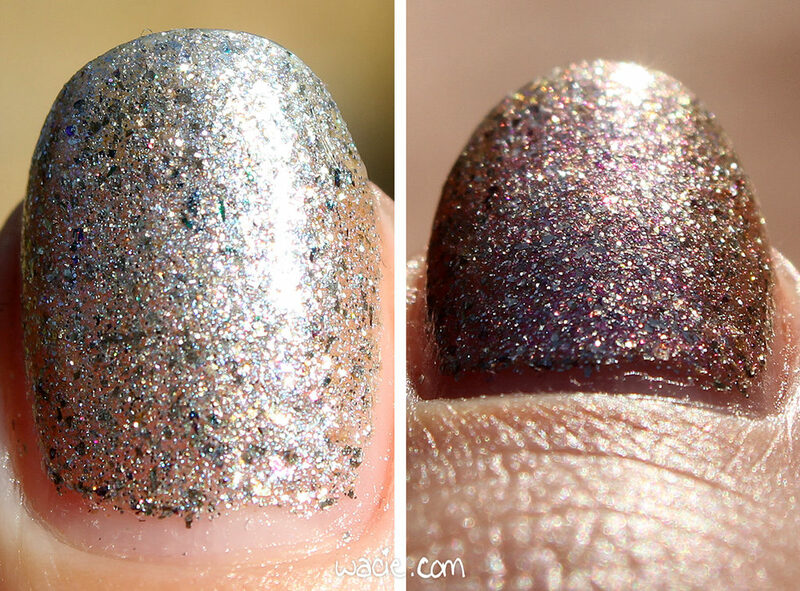 Siren’s Quarter Life Crisis was a holiday gift-with-purchase polish from I don’t even know how long ago. Clearly, I’ve been buying BEGL a long time. This was the first GWP, I think, and it was a pretty small batch, being capped at 15 bottles. I picked this to go with 2014 because the primary colors are pretty close; one adds color than sparkle to the look, while the other does the opposite. I think it turned out pretty well. 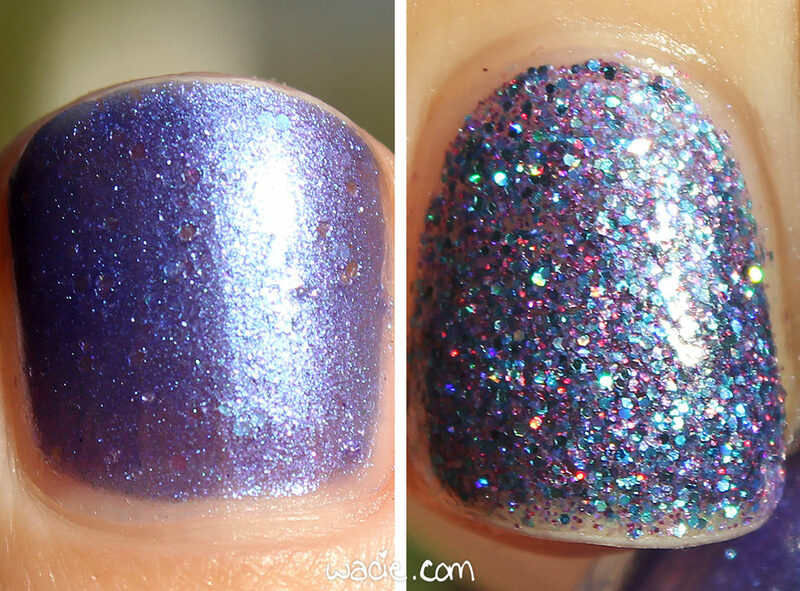 Neither of these polishes are still available from Blue-Eyed Girl Lacquer, but other BEGL polishes are available in the online shop (which is currently on hiatus). I bought 2014. The Siren was a gift with purchase. Welcome back, reader! My swatch today is yet another Indie Shop Atlanta buy. 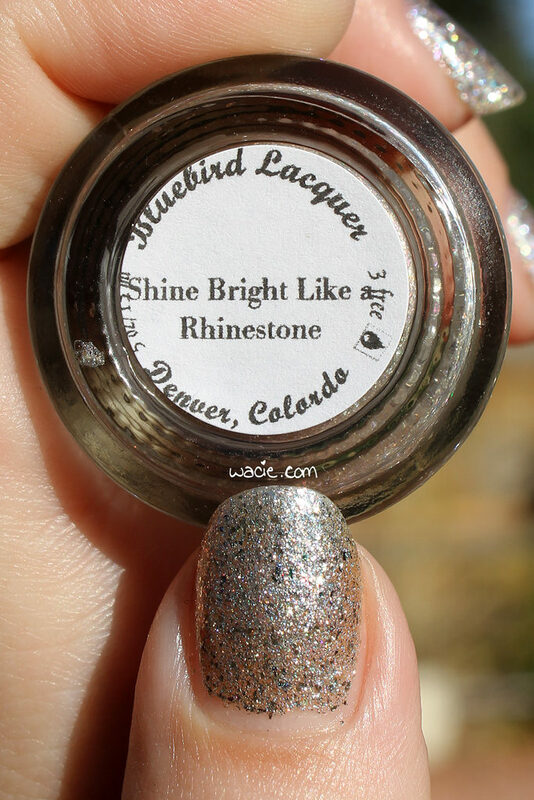 It’s funny; in case you missed it, Indie Shop 2018 locations were announced today, and they’re returning to Atlanta in March, so I’ll have the chance to go and buy more polish that I won’t even get to swatch until next year. I do hope I’ll see my favorite makers again though! 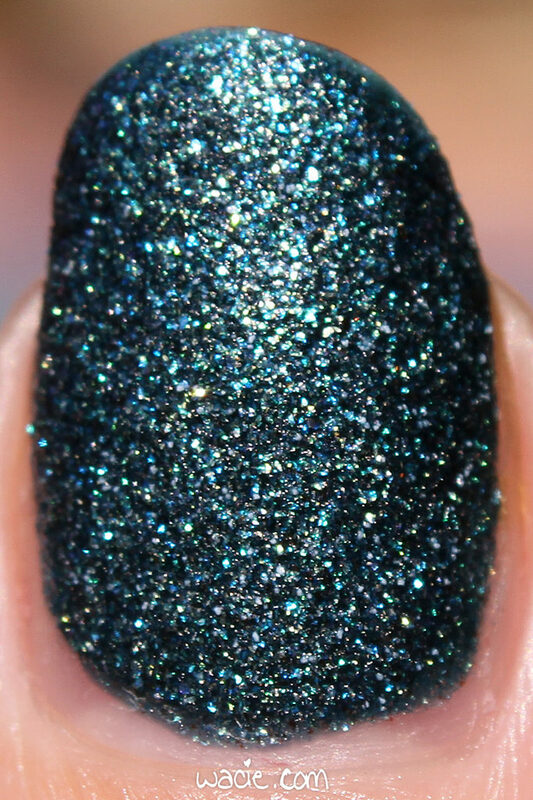 Anyway, this is Bluebird Lacquer‘s Shine Bright Like a Rhinestone, and it’s one of the best polishes I bought last year. I’m wearing three coats with one coat of Seche Vite. 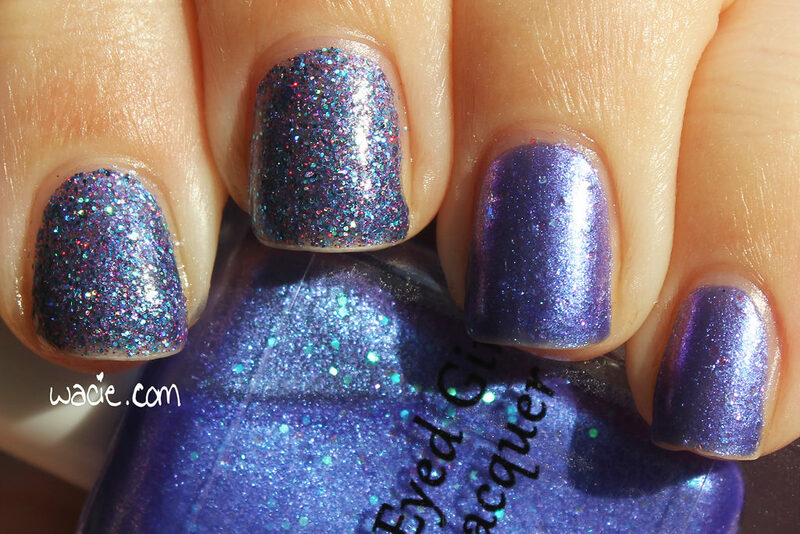 Shine Bright Like a rhinestone is a clear-based microglitter polish with silver flakies, silver glitter, a little bit of holo, and a blue-to-purple shifting shimmer. Application was easy; the product consistency is easy to work with despite everything in it. As with most microglitters, coverage builds up to full opacity; I got full opacity on the second coat. The polish dries to a smooth finish; I used top coat for extra smoothness and shine. I’m afraid I didn’t really do this polish justice. There’s so much going on in it, and it was so much better in person. 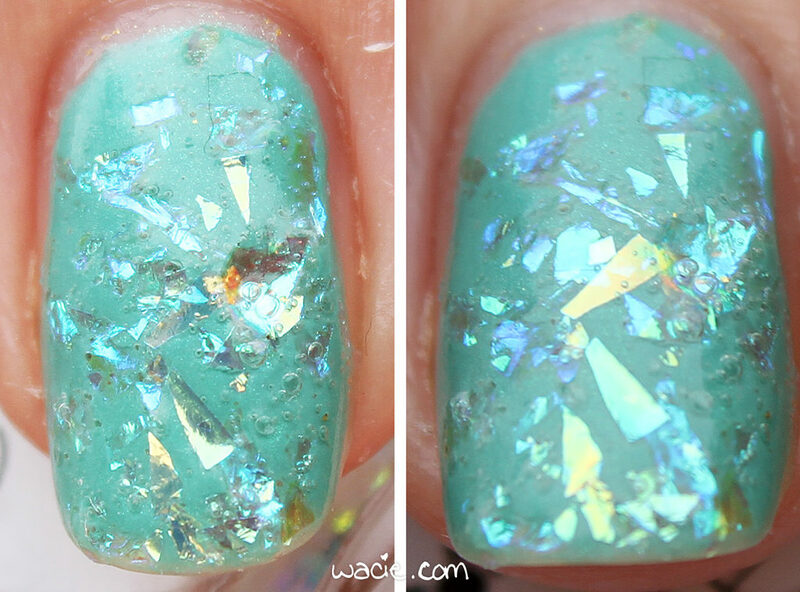 For example, the blue shimmer, which gives the polish an icy glow, isn’t easily seen in these photos. Aside from that, I love this polish. I love any polish that turns my nails into disco balls, but this one has been a nice change of pace with the extra shifting shimmer. It was a ton of fun to wear. As of this writing, Bluebird Lacquer is closed for the holidays, but will reopen.